Breanna Shingleton is a past graduate who can’t seem to get enough of the West Virginia Junior College family and continuing her education. 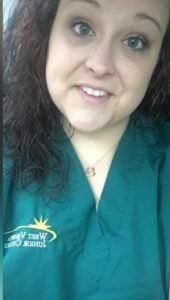 Breanna graduated from WVJC in 2013 from the Pharmacy Technician program. Her favorite thing about WVJC was that “everyone was friendly and knew her by name”. It’s a small campus which allows for more one on one time with instructors. This was a major factor in her decision to return to WVJC for the Practical Nursing program. Before making the choice to enroll in the nursing program at WVJC, Breanna worked in the Pharmacy Technician field and also worked as a Certified Nursing Assistant. Breanna enjoyed her work, but never felt complete. She knew her lifelong dream was to become a nurse and she lives by the words “never let anyone tell you that you can’t, because you can do anything you put your time and heart into”. “I have been in the medical field for six years now and I can’t imagine myself anywhere else”, she says. Breanna knew she was progressing on the path to achieving her lifelong dream and choosing WVJC to help her along her journey was easy. Breanna’s favorite parts about going to WVJC are the small classes, friendly atmosphere, and continuously welcoming feeling. She has many favorite teachers and staff members who motivate her to work hard and strive for success. Some of those faculty members are Ms. Alice, Mrs. Burner, Mrs. Wilson and Mrs. Frye. These ladies always keep classes interesting, make her feel like she is where she is supposed to be, and help her to remain upbeat.